Lit tle blog, are you ok? It has been so long since your last post you probably thought I had entirely forsaken you. I can only apologise and, to be honest, tell you that I ran off with Neal Stephenson and was then seduced by the Easter sunshine. I’m sorry your writer is so fickle. But, like a bad penny, I have returned and I can’t wait to tell you all about the long, long, long book that is Quicksilver. It took me the whole bank holiday weekend to read it and then the past few days to get up the strength (and time) to write to you about it. 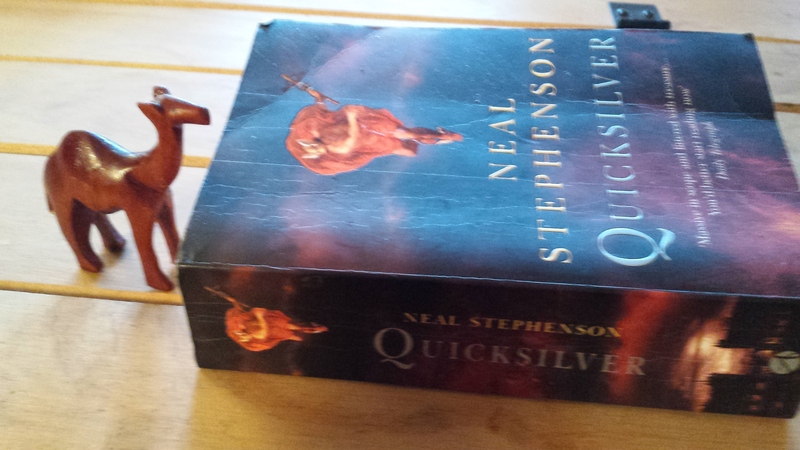 Quicksilver is a very impressive book. Set around the time of Isaac Newton it covers natural philosophy, the emergence of sophisticated commerce, European realpolitik, religious dissent and class. It many ways it is a breathtaking show of intellectual bravado, in others it is a gripping story and yet, at the same time, it left me ultimately unsatisfied. If you are interested in history, in mathematics, in science or politics you should read this book. The book is divided into three sub books which sort of fit together so I will review them each and then pull it together. In many ways Quicksilver provides both the beginning and the end of the trilogy. It follows the story of Daniel Waterhouse, a natural philosopher who has emigrated to Massachusetts. The story begins with the arrival of an alchemist on a mission to get Daniel to return to London to heal a rift between Newton and Leibnitz. As he makes up his mind about whether to return, we get flashes back to his youth when he embarked on his career as a natural philosopher, befriended Newton and became part of the fledgling Royal Society. It is interesting both for the historical detail but also, if you are into that kind of thing, for the lengthy descriptions of the scientific and mathematical principles that Newton et al were working on (whoever Al is). I skipped over those to the bits about the mad experiments they did, but there is lots of maths for those who want it! It sets up a lot of the historical detail that is built upon in the next few books, but even as a standalone story is interesting. It had a really driving plot and is a gripping read in spite of all the information packed into it. I assumed at the end of it that the following books would pick up where this one ended with Waterhouse deciding to return to the UK, but alas, that was not to be. But no! This one begins a few years after the early life of Newton described in the flashbacks and follows the adventures of Jack Shaftoe. This is a tale of gleeful derring-do and swashbuckling high jinks. It follows Jack, a low born Londoner, as he roams around Europe getting into scrapes but also becoming increasingly famous. Along the way he joins an army, escapes the army during a battle in which he acquires a war horse and rescues a girl called Eliza from a harem. Or maybe she rescues him. He travels with her to Amsterdam where it turns out she has a brilliant head for profit, and then he leaves her (I still don’t know why) to go to Paris and sell some ostrich feathers. It is all a bit like that. And there is a good bit with some pirates. But along the way we learn a lot about the great trading port that was Amsterdam and the development of modern commerce. We learn a lot about the political intrigues of the period and, through Jack and Eliza we learn a lot both about life for the poor and Machiavellian games of the aristocracy. Eliza carves a real niche for herself in Amsterdam and begins getting involved in some serious political intrigue. So now we continue following Eliza, but Daniel Waterhouse also re-enters the story. The plot thickens with religious dissent coming to the fore for Daniel as he is made a figurehead for the dissenters. We learn more about the disputes and research of the Royal Society and you really get an impression of how men in his position walked a narrow tightrope between freedom and the Tower. Meanwhile Eliza is pulled deeper into the life of the spy. She becomes embedded in the court in Versailles and was working for so many different spy masters and royalty that it became hard to keep track. You really get a sense of how the dynastic changes in England were viewed on the continent and how the might of the Sun King in France influenced life all over Europe. There is also a real insight into trade and the emergence of the stock market. Quicksilver with a camel for perspective. It was long. My only complaint about this book (apart from being 916 pages with very small print) is that the three stories didn’t pull together well enough for me. It is challenging that the first book contains the end of the story because 700 pages later when the book ended I was already a bit vague about exactly what had happened at the end of the first book. I even considered re-reading it but decided that was not a good use of time. This left me feeling a bit dissatisfied, but I believe these books are part of a wider cycle so maybe if I read the remaining books it would all come together more. It also would have been improved for me if it had a note at the back outlining which elements were fictional and which were grounded in reality – but that is probably just my inner history geek showing. But, overall, it was a great read. 4 days was too short a time to really enjoy it to the max so it is one that I will probably come back to next year. A great bit of historical fiction! Tags: book, book review, books, Fiction, History, London, natural philosophy, Quicksilver. Bookmark the permalink. Whew! It all sounds too complicated for my simple mind, but glad you enjoyed it! 916 pages in 4 days – you deserve a medal! I certainly needed a gin!